Since their inception in 1979 William Christie and Les Arts Florissants have introduced us to some truly wonderful music, especially from the French baroque, with this CD being no different. This disc follows on from a wonderful disc which I remember buying when it came out in 2016, Bien que l'amour … Airs Serieux et a Boire (HAF 8905276), which I have enjoyed ever since. The mixture of more established names such as Lambert, Couperin and Charpentier being a real delight, especially when presented along with more unusual or even obscure composers such as Honoré d’Ambruys to produce a varied and enthralling programme made me long for more, and whilst there was no indication that there would be more, I am more than happy to see this second volume arrive. Once again William Christie and Les Arts Florissants have chosen a varied program which continues their exploration of the vast repertoire of songs of lyrical and pastoral poetry, focusing on the masters of the genre, presenting the music of Marc-Antoine Charpentier and Michel Lambert with that of lesser-known composers Etienne Moulinié and Sébastien Le Camus, who whilst known to me, sadly do not feature on many discs in my collection, which on this evidence is a real shame as they don’t just make up the numbers; their contribution is a vital part of this disc. The best known of the composers presented here is Marc-Antoine Charpentier who is represented by six pieces opening with the ‘Ouverture. Scènes 1 & 2’ from Téméraire Alcidon; whilst this sets the scene well with some excellent instrumental work (something that is a feature throughout this disc) it is the contribution of the three solo male singers, Reinoud Van Mechelen, Cyril Auvity and Lisandro Abadie, that really makes this track stand out. There is some nicely considered interplay between the three which brings this lovely scene between the two shepherds and the god Pan to life. However, it is his ‘Amor vince ogni cosa’, that people will remember most, especially with its depiction of animal noises, a wolf and sheep, from the singers. Michel Lambert is probably best remembered for his tender Leçons De Ténèbres and his Airs de Cour and was also represented on volume one. Whilst his music, other than the Leçons, is usually featured on compilation discs, there have been a few discs devoted to him and his music, including an earlier incarnation of Les Arts Florissants devoting a disc to his Airs de Cour (HMA 1901123) which was originally released in 1984 and still sounds as compelling as it did then. Here he gets seven tracks, with the beautiful lament ‘J’aimerais mieux souffrir la mort’ being a highlight, along with his ‘Vos mépris chaque jour me causent mille alarmes’, in which the tenor Cyril Auvity is the beautifully tender soloist. I only have a single disc dedicated to the music of Etienne Moulinié, the wonderful Meslanges pour la chapelle d’un prince (HMC 902194), although his music does feature on a number of other discs that I have. His contribution here includes the feisty acapella ‘Amis, enivrons-nous du vin d’Espagne en France’, which although less than a minute long, makes a real impact, as does his tender bass aria ‘Enfin la beauté que j’adore’, in which Lisandro Abadie shines. His other featured track, ‘Guillot est mon ami’ is another characterful acapella piece, which ends with the singers in a fit of laughter. Probably the least-known composer here is Sébastien Le Camus who was a musician in the service of Luis XIII, his music features on the disc Douce Félicité - Airs de cour (MF8027) along with that of Lambert, Lully and Sainte-Colombe. His music is earlier in feel and less adventurous than that of the other composers, although the soprano Emmanuelle de Negri makes a sparkling case for his music in ‘Ah, que vous êtes heureux!’, as does mezzo Anna Reinhold in the beautifully passionate ‘Laissez durer la nuit, impatiente Aurore’. 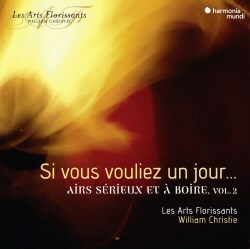 This is a wonderfully engaging and interesting release, one which once again shows that Les Arts Florissants and William Christie remain masters of this repertoire. The singers and instrumentalists are excellent throughout, with their unfetted clean lines captured perfectly well by the engineers. Excellent notes and full texts in French, English and German are included, makr this along with the first volume, a most worthy addition to any collection of French baroque music.